American Writers & Artists, Inc. (AWAI) is a leading publisher of direct-response copywriting, travel writing, photography, and graphic design home-study programs. Their annual FastTrack to Copywriting Success Bootcamp is held in downtown Delray Beach, Florida (where the company is based) at the luxurious Marriott in Delray Beach. This conference focuses on helping attendees sharpen their copywriting skills for a variety of different media: direct mail, print, web, etc. Zion & Zion sent us (Associate Content Developers Patty DiMaggio and Taylor Birchall) to the bootcamp to further our knowledge of sales-driven writing and to bring back ideas we can share on how to better help clients improve their marketing and, of course, increase their revenue. 1. Almost everything you write for the web is direct response. Direct response is extremely important to keep in mind throughout your marketing efforts. For example, on social media, you want people to like and comment on your posts, i.e., respond. Or if someone goes to the homepage of your website and then leaves without signing up for your newsletter, contacting your sales department, making a donation/purchase, or taking any other action that would create a relationship with your brand—that homepage has ultimately failed! This is something you can apply immediately to the website content you write for clients. Focusing on getting users to respond when you’re writing copy, and also in the design/user experience (UX) and information architecture (IA) of the site itself, will help you get even better results (and therefore increase your ROI). 2. Examine your finished product. As content developers, there’s an immense feeling of accomplishment when a client’s website has launched with your words published on the pages. You do the extensive research, learn about the company, create a content strategy, and successfully represent the brand. However, according to Copywriter and Novelist Richard Armstrong and the Content Developers here at Zion & Zion, you’re still not done. Armstrong supported our understanding of copywriting by stressing the importance of analyzing copy to determine what went well and what didn’t. This applies to copy written for websites, landing pages, social media, blogs, newsletters, etc. Did it result in an action? Did the user want to learn more about the company? Did they download your whitepaper? Whether or not you see an increase in sales, contact form submissions, or visitors to the site, you should always look for ways you can improve. And for the projects that resulted in a significant growth in readers, you should dig deeper through analytics and/or testing to learn why a piece of content was more appealing to an audience, and apply those tactics to future projects. Although this is a common practice we currently implement at Zion & Zion, it was constructive hearing the importance it has on a user and how we should increase the frequency of analyzing our content. 3. The process of learning a new skill. Writing is like learning any other skill. It takes practice. Mike Palmer spoke about the psychological process everyone (including himself) experiences when deciding to learn a new skill. However, the way you go about learning the skill and how you decide to push through each stage of learning is different. Uninformed optimism – Envisioning that this is a skill you really want to do. You’re ready to start learning. Informed pessimism – The skill isn’t as easy as you thought it was going to be. You start seeing the downfall in things. 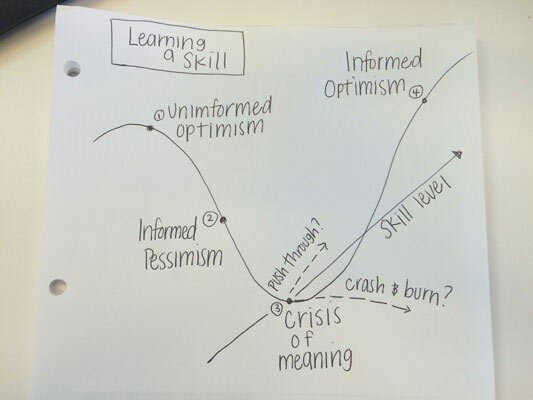 Crisis of meaning – Start to question if the skill is “too hard” and if you should keep going. This is the point where you decide to push through, or give up. Informed optimism – You continued to push through and are improving greatly, but this doesn’t mean you’re a master. Writing takes practice and each piece of content is different. As a writer, you have to acknowledge that there will be times of psychological struggle, but that it’s only a phase of the process that you must push through in order to excel and become experts in your field. 4. Five steps to writing copy that rocks. Writing requires a sense of creativity, a different way of thinking. It’s successfully communicating to your user through persuasion, relatability, or emotion. Writing is its own science. However, in order to create content for clients on a wide variety of topics you aren’t always familiar with, you have to overcome your fear and manage the uneasy feelings that could stop you from committing to your copy. Embrace the fear – fear is the best motivator. Think about the worst case scenario and talk yourself through it. Take a look at some of your previous work and compliment yourself on it. Baby step your way to success – learn about the client. Look through their current web content, sales collateral, anything with information about the company. Note what you don’t like and mark what you do, then categorize your findings. Dream… dream… dream – take a break and review what you’ve finished. Take a fantasy break and think about a place you feel relaxed and at ease. This helps clear your mind before diving back into your content. Reward yourself often – set a goal for yourself, such as finishing a specific outline or hitting a word count. Once you hit a goal, whether it’s weekly, monthly, or annually, give yourself a treat. It helps you feel good about what you’re doing. No matter how honest, genuine, and true your brand is, you have virtually zero credibility on the internet. There’s so much noise in cyber space, it’s nearly impossible to separate fact from fiction. Therefore, if you want to create “brand advocates” i.e., customers who are loyal to your company, then you better be a brand that’s worthy of their trust. It’s no longer enough to tell everyone you’re honest, you have to prove it by showing them you are. As a writer, it’s your job to communicate to the world what a brand has to offer and what sets them apart. Take this a step further by showing (offering proof), instead of just making claims. Whether that’s through a customer’s story of how the company helped save them from the brink, or a behind-the-scenes video of the company doing something different or extraordinary, there are many ways you can implement this takeaway with your upcoming projects. AWAI’s FastTrack to Copywriting Success was a “success” in our eyes. We both got a lot of value from it and came away with lots of great information and reassurance that what we do as an agency is working. If you’re looking for a conference that will help you write better copy, then we highly recommend you get to next year’s event!